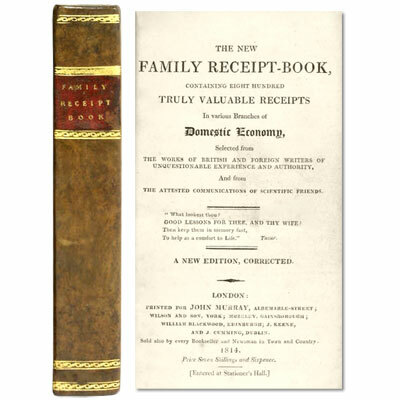 The New Family Receipt-Book, containing eight hundred Truly Valuable Receipts in various Branches of Domestic Economy, selected from the works of British and Foreign Writers of Unquestionable Experience and Authority, and from the Attested Communication of Scientific Friends. - David Pugh, Maria Rundell 1814 - John Murray, London - A New Edition, Corrected. A beautifully bound, compact collection of recipes, household advice, and medical tips, this volume includes ingenious articles such as: ‘Easy Method of Curing the Sea-Scurvy’, ’To Increase the Force of Gun-Powder’ and ‘Method of Rendering Assistance to Persons in Danger of Drowing' to name but a few. Helpfully organised into categories such as ’Agriculture', ‘Distilling’ and ‘Pleasing Experiments’. According to Arnold Oxford (English Cookery Books) this compilation was published to accompany Maria Rundell’s highly successful New System of Domestic Cookery’. Although Oxford states that this was written by Mrs Rundell, it is more likely that the compiler was David Pugh who worked on a number of ‘Family-Receipt’ books for several publishers under the pseudonym of David Hughson. References: Oxford, English Cookery Books 135. Bitting, Gastronomic Bibliography 582. Maggs, Food and Drink Through the Ages (Cat. 645) 351. Not in Cagle, A Matter of Taste.